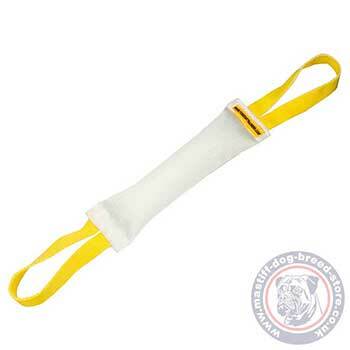 Dog tug toy for mastiff training “Interactive Game” is made of a fire hose, stuffed with flexible soft material. Fire hose is an extra-dense material with a high strength and wear-resistance. Two comfortable handles of nylon allow to hold a dog tug securely in your hand, without a fear of being accidentally hurt by your mastiff. Mastiff big dog bite tug can train your dog fetching, improve good physical shape, increase drive and motivation, form a dog grip and young mastiff dogs' and puppies' bite training. Strong and durable big dog tug toy of fire hose “Interactive Game” will allow you a long-term usage of this biting training equipment. 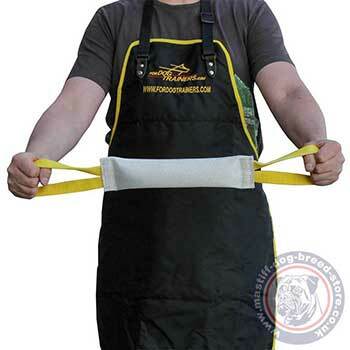 Mastiff big dog bite tug is specially designed for mastiffs and other big dog breeds. Mastiff dog breeds, such as English Mastiff need to be trained since their puppyhood. Our dog toys will help you to form good biting skills of your mastiff young dog. Our product is aimed on making your mastiff well-trained, healthy and fit. Top trainers are constantly working on training equipment to provide you and your pet with the best products.